Well, how did Murray Heasman's interest in Celtic knotwork begin? I used to play (well, try to play) a classical lute back mandolin (and before that, the Scottish bagpipes). When in London, a friend and musician, Vince Millet of Secret Archives of the Vatican, encouraged me to buy an electric mandolin, so off we went down to the local music shop. Plugging it in and blowing my brains out and always wanting to be a rock star, but never any good, I bought it anyway. The only problem was that all the guitar straps were far too long and I wanted something shorter. So then began the quest to make something myself. Vince lent me the book "Celtic Art - The Methods of Construction" by George Bain, which was a revelation. 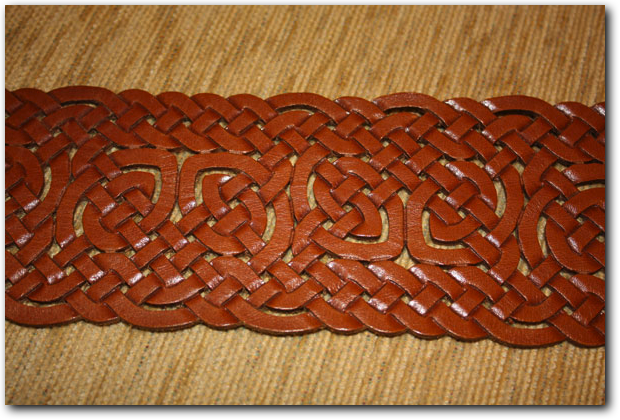 I began designing a way of carving a single piece of leather so that it looked like it was actually a woven Celtic knot. The resulting strap was one continuous knot, crossing 712 times. Thereafter, I made a few heavier straps for guitars. One day I had a call -- Jimmy Page loved the straps and wanted to meet me in their London rehearsal studio, with Robert Plant, too. Whoa, I had my own gig with the greatest living rock-guitarist in the world -- I remember actually having to physically pinch myself. He also had a collection of beautiful handmade guitars there. That was a seminal moment for me -- I thought "there must be something pretty amazing in this Celtic knotwork, so what else can I make?" At the time, I was a cabinetmaker and woodcarver -- everything I made was a one-off commission, and I found it hard to make any money, so I was always on the lookout for a stock item. Two weeks later, I woke up at 2 a.m. and had a brainwave -- "I'll invent a game using these Celtic knots." My wife found me cutting up bits of cardboard for the next two days in order to make a working prototype. I play-tested it continually for years to get it working well. During this process, friends mentioned they knew someone who invented games, so I gave him a call. This turned out to be Tom Kremer, the guy who marketed Rubik's Cube. He liked the game so much that he signed me up to try and licence it out. He happened to be from Transylvania, and, when I was hesitating over signing the contract, I remember him showing me his teeth! The game was very crude back then, so it was no surprise he came back without a deal, so handed it back to me. He told me to me to get myself over to Spiel in Essen, Germany, the world's largest games convention, and introduced me to Alex Randolph, the grandmaster of game inventors. He loved the game so much that he took me under his wing and introduced me to all the folks that mattered. I managed to get a backer and launched the "Game of Kells" a few years later at Essen, to much acclaim. Two weeks after we had the game from the manufacturers, my backer died suddenly at the age of 40. The company wound up, and I went back to my woodcarving. A few years later, I began getting it out again down the pub and so many people encouraged me to get it going again. After much work reconfiguring and redesigning it, Jeremy Irons launched the renamed "Tara" in the Collector's Edition in De Barra's, Clonakilty, in 2004. The following year the Family Edition came out. So Jimmy, I bet you didn't realise that you were the catalyst for this game called Tara! And now Knotiverse! I hope you'll get back in touch soon -- please! Murray Heasman is the founder of Tailten Games, the creator of Tara -- Ireland's Royal Board Game and Knotiverse -- Infinite Knots, Endless Fun.